Crossmaglen had one possession, and one shot, more than Gaoth Dobhair. The kickouts were almost the mirror image of each other with both winning 13 of their own and 8 of the opposition’s. Crossmaglen didn’t give up the ball outside Gaoth Dobhair’s 45. Yet despite the closeness of the main metrics the game petered out to a comfortable seven point win for Gaoth Dobhair. Not for the first time we end up writing that goals win games. Before we move on; a quick note on the relentless nature of the opening period in this game. Up until the 2nd goal at the end of the 12th minute there were 21 possessions. Convert that to a typical intercounty game (~76 minutes) and it put the game on pace for 120-125 possessions which is genuinely unheard of. The highest I have, in an intercounty Championship game, since 2015 is 116. And that start wasn’t a mistaken ridden turnover fest either. There were 17 shots in those 21 resulting in 14 kickouts which really should have slowed the game down. The game just opened up at a phenomenally (unsustainable) pace. Gaoth Dobhair produced 0.53 points per possession which eclipsed their excellent 0.47 from when we last saw them in the county final against Naomh Conaill. The way they achieved it was very different however. In the county final they relied on excellent accuracy on point attempts; 69% from play (0 – 09 from 13 & Expt Pts of +2.48) and 80% from deadballs (0 – 08 from 10 & Expt Pts -0.01). They didn’t produce a shot on goal. As can be seen from the shot chart above their radar was off on point taking (0 – 10 from 22 for 45% on all point attempts; Expt Pt of -1.59) however that didn’t matter – their running game pulled Crossmaglen apart producing 4-01 from just five shots at goal. Dara Ó Baoill had a day of days. Undoubtedly the highlight was scoring 3 – 00 from his only three shots but he also plucked two Marks off Crossmaglen kickouts that led to two shots as well as providing the vital block to deflect McKenna’s goal chance early in the 2nd half. Ó Baoill was ably supported by Mac Niallais & Ó Casaide up front as they combined for 1 – 05 from 8 shots from play (Expt Pts +3.12). This follows on from the 0 – 04 from 7 (Expt Pts +0.51) they produced in the county final. Mac Niallais was also very busy around the park topping the assists chart with five. 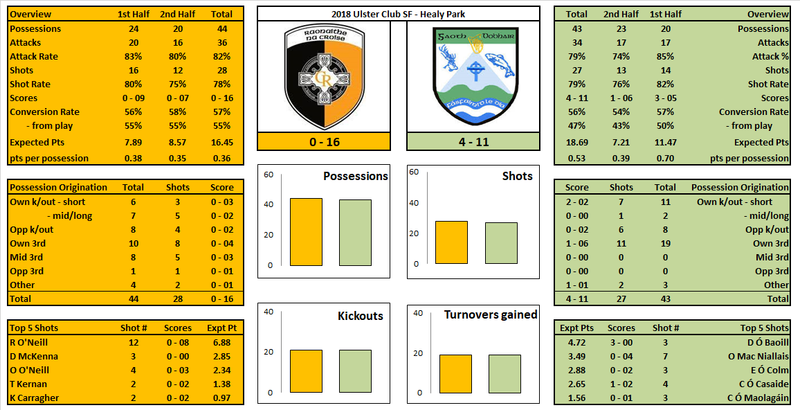 Nothing in the numbers will do justice to the way Crossmaglen play but you can see glimpses of what they look to do therein. Not once did they turn the ball over outside Gaoth Dobhair’s 45 which is very unusual. As a counterpoint Crossmaglen got their hands on nine turnovers outside their own 45. They managed to do this by judicial use of the kick pass through the lines before looking to move the ball inside. On top of ball control their shooting was very good; 0 – 09 from 17 (Expt Pts +1.78) from play and 0 – 07 from 9 (Expt Pts +0.17) on deadballs. It was their lack of goal chances that hurt them. Just the two in total, both in the second half, with the second coming in the 61st minute when the game was done. That’s not to say they did not threaten Gaoth Dobhair. Despite the gut punches of two early goals, followed by a third from the penalty spot and then another punch with the red card just after half time they were still standing after 40 minutes having reduced the deficit from 0 – 09 to 0 – 04. Aaron Kernan came through unmarked, just to the left of the D no more than 25m out, with what is a readily scoreable chance to reduce it further to 0 – 03 but instead dropped it into the goalkeeper’s hands. Gaoth Dobhair launched an attack and 30seconds later C Ó Casaide popped over a point after a fortuitous bounce placed a Crossmaglen interception in his lap. From a possible gap of 0 – 03 they were 0 – 05 behind 30seconds later via a lucky bounce and Crossmaglen never got as close again. A quick note before we leave Crossmaglen. This is the 3rd club game that has been covered on the blog (aforementioned Donegal county final as well as the Roscommon County final) this year and in all three the losing team has had a man sent off just after half time. Now in all three cases the team were chasing (either on the scoreboard or in general play) but the cause was made immeasurably more difficult by being reduced to 14. On the surface things were very even with both teams having the same returns; winning 13 of their own and 8 of the opposition’s. 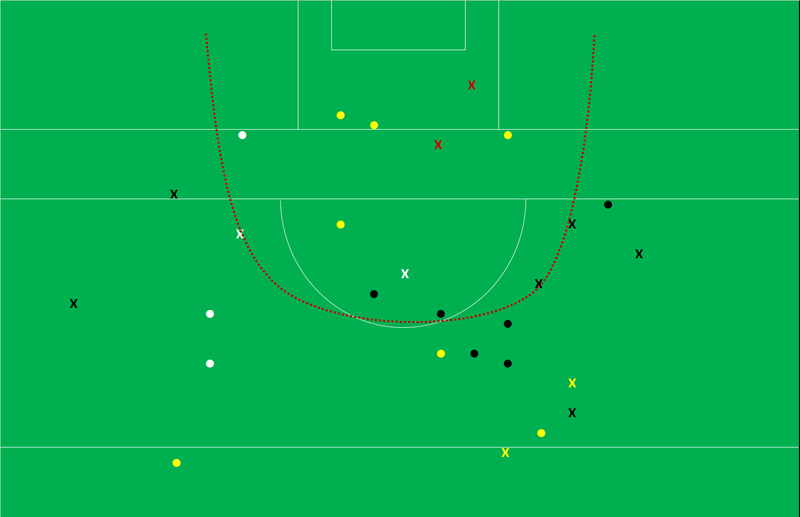 In terms of a contest however Crossmaglen came out on top winning possession 63% (15 – 9) of the time when the ball crossed the 45 and claiming five marks to Gaoth Dobhair’s three. They were able, somewhat, to press this advantage producing three more shots and scoring 0-03 more than Gaoth Dobhair from these kickouts. It wasn’t enough however. Gaoth Dobhair were able to get half (11 of 21) of their kickouts away short and in doing so produced seven shot scoring 2 – 02. One thing that the numbers cannot measure is grit. Castlebar were on the end of an absolute blitzkrieg in the first 20 minutes. When Jamie Clarke popped over his second point to make it 0-08 to 0-3 Crossmaglen led the possession stakes 21 – 13 and were 14 – 7 ahead in shots. Indeed by the 7th minute Crossmaglen had unleashed 7 shots and had seen a Jamie Clarke effort dribble just past the post. Castlebar on the other hand had entered Crossmaglen’s 45 just once during that opening assault. It is to their immense credit that they were still in the game at half time let alone managed to overhaul Crossmaglen. Crossmaglen had two very good goal chances in the first half. Alongside the aforementioned Clarke opportunity Murtagh had an effort cleared off the line after rounding the keeper. Had either gone in Crossmaglen may well have been out of sight. As it was Crossmaglen, upon the restart, struggled to reproduce their first half output manufacturing just the seven shots from play and scoring 0-02. What of Castlebar? They struggled for long periods. They went a full 16 minutes in the first half without a point attempt from play. In the second half they managed just the five shots from play with one in the last 20 minutes. There is the argument that they weren’t manufacturing shots from play as Crossmaglen were fouling. 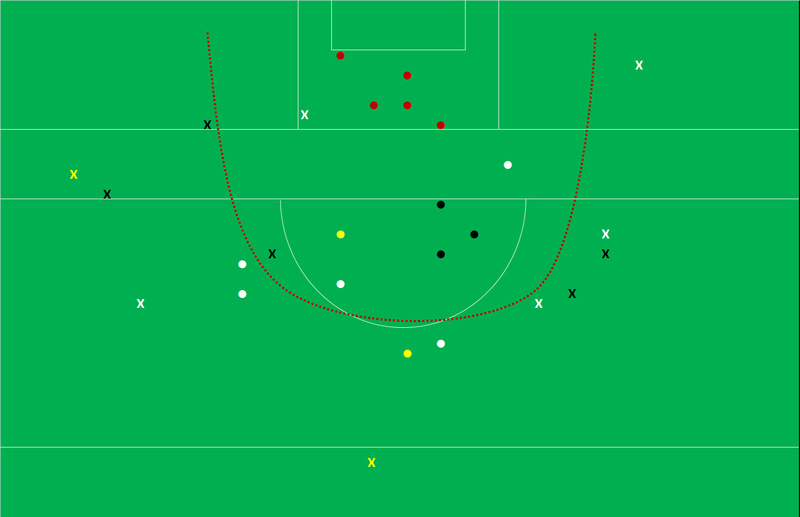 Whilst there in this to explain their suppressed numbers the sense I got as the game progressed was that Castlebar were not being denied opportunities through Crossmaglen’s fouling but rather were being handed easy chances through Crossmaglen’s rashness. They will want to produce more against Ballyboden in the final. One quick note on Jamie Clarke. It is a shame we won’t see his unique skillset in an Armagh jersey this year. I’m not sure I have seen any player take as many shots from the “wrong” side – and as effectively – as Clarke did here. Five of his seven shots were taken with the left foot from the left side of the pitch. He scored 0-04 from those five shots with some of them coming from a very acute angle. Not a vintage deadball day but then comparing a heavy winter ball, on a soggy pitch, against intercounty Summer football is probably unfair. Still nothing can excuse that missed free from the 20m line! Douglas had nine deadball attempts converting 67% (0 – 06). This is in line with Summer averages however on the whole his chances were of the easier variety as shown by the fact that he was expected to score ~7.4 points from those nine attempts. A relatively even battle aided somewhat by the fact that both teams eschewed the short kickout; there was just two in total both coming from the Crossmaglen keeper. Given the fact that Crossmaglen converted 90% of all their attacks into a shot it is no surprise to see that they were very good at getting a shot off once the kickout was won. Looking ahead Castlebar will be a bit concerned at just how easily Crossmaglen could manufacture scores from set ball. 0-10 of Crossmaglen’s total emanated from kickout possessions with 0-06 coming from the 11 Castlebar kickouts they won. Although they won just as much primary ball Castlebar were not as good at manufacturing an end product. 0 – 07 of their total score came directly from possession won on kickouts with 0-03 coming from the opposition’s kickout.